Many Harvard graduates are moved to give back to the School that gave them so much. But few can claim they have done so for half a century. 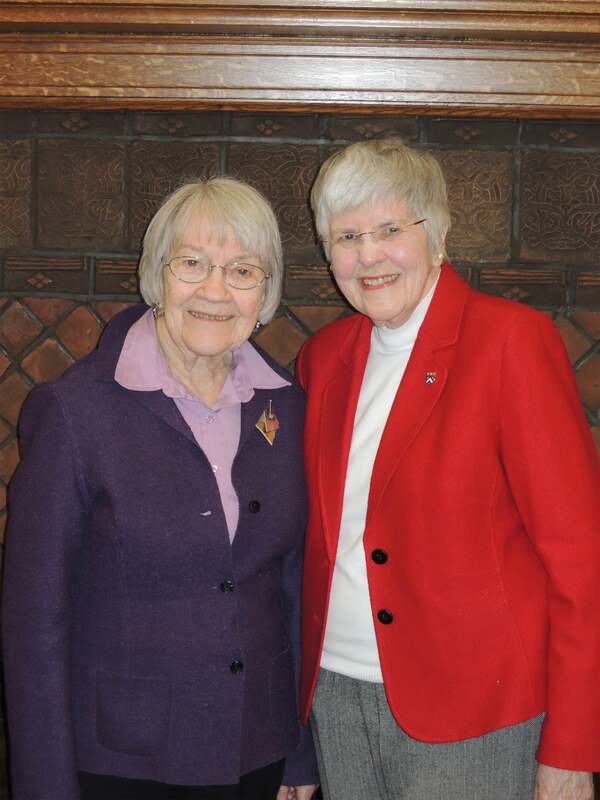 Ruth Gove, 92, and Marion Cameron, 83, are original members of the Harvard Extension Alumni Association (HEAA). With the association celebrating its 50th anniversary this year, the two of them met at the Harvard Division of Continuing Education. There, in front of stacks of immaculately preserved photos, magazines, bulletins, letters, and documents, they remembered the people, places, and events that shaped the School and their own lives, and inspired them to dedicate decades to the association. “It’s [about] giving back, because I had received so much as a student,” Cameron said. Cameron and Gove attended Harvard Extension during a period when many women didn’t pursue a career, let alone a degree. But Gove had aspirations of becoming a special education teacher, and Cameron wanted to complement her health care background with classes in computer programming, and the School was — as it is to this day — a place where students of almost any age or education level could take affordable courses on their own schedule. Many students who cannot pursue a traditional degree program find their academic community at the Extension School, which was founded on the idea that a College education should be accessible to anyone with the will to pursue it. The formation of the HEAA bolstered that mission. In 1968, Dean Reginald H. Phelps and two Extension School alumni, Ella Smith ’66 and Edgar Grossman ’66, established the HEAA to give graduates a network to support their personal and professional enrichment. Today, HEAA is under the umbrella of the Harvard Alumni Association (HAA), and members share many of the same benefits as other University graduates. The association keeps graduates connected and engaged, in part thanks to Cameron’s long involvement. At Smith’s urging, Cameron was on board from the beginning, serving as the HEAA’s president from 1980‒1982 and representing it on the HAA’s board of directors from 1983‒1985. “I took [Smith] at her word, and I never regretted a moment,” Cameron said. HEAA events introduced her to such notable figures as Mother Teresa, King Juan Carlos of Spain, Tennessee Williams, and violinist Itzhak Perlman. At $15 a class, the School took her from a job as a medical secretary to a career in medical informatics — making her a pioneer not only for women, but for the industry in general. At Massachusetts General Hospital, she worked with Dr. G. Octo Barnett in his Laboratory of Computer Science, where they helped initiate the use of computers in health care. Marion Cameron's contributor photo from a 1984 HEAA newsletter. Ruth Gove's 1967 graduation photo. Cameron would achieve other firsts. During her time as HEAA president, she worked with Dean Michael Shinagel to get equity for Extension School alumni, and she helped earn the School its own shield. Like Cameron, Gove was first drawn to the Extension School for enrichment. She turned to education to keep herself occupied after her children were in school. After earning her bachelor’s degree Gove went on to Northeastern University for her master’s in special education, a field in which she worked for more than 20 years. Gove taught at St. Ann’s Home and School in Methuen before taking a job with Lynn Public Schools, where she helped establish a program for emotionally impaired students. She later was one of the first teachers at the Lynn Community Day School, a collaboration with the NSMC Union Hospital. Gove spent the last years of her career as the head teacher of special needs at Eastern Junior High School in Lynn. For Gove, staying involved in the HEAA throughout those years was a respite from a rewarding yet emotionally consuming career. “When you have a difficult job, a job that takes emotional energy, having something like that to attend to was a joy,” she said. It also gave her a social network of people with whom she made lifelong friends and traveled the world. Gove and Cameron were both integral players in continuing the Commencement Day alumni gathering at Weld Hall started by Smith. Each year, HEAA members gather on the second floor of Weld to watch the Commencement ceremonies in Harvard Yard, while socializing and gearing up for the alumni parade in to the Afternoon Exercises. The Weld gathering and the annual alumni banquet in Annenberg Hall are traditions that have endured since HEAA’s inception — as has Gove and Cameron’s attendance. Last year, Gove received the Michael Shinagel Award for Alumni Excellence at the banquet. This weekend, she’ll speak at the 50th anniversary luncheon at Loeb House. Asked why they would put in all the effort, decades later, Gove and Cameron said it was simple. “It was a testament to how much we appreciate what we received,” Cameron said. "When the [Kerner] report came out, it was a period of turmoil ... people felt that civilization was on the brink of collapse," said Orlando Patterson. "In a way, what is happening now is similar to what happened then. And like in the past, the right and the left are at loggerheads about which direction to take."